BMW is hatching plans for a hot entry-level M model based around a new saloon version of the second-generation 1-series. The compact four-door aims to provide BMW with a direct rival to the upcoming Mercedes-Benz CLA45 AMG and Audi S3 saloon. The new BMW has already been earmarked to run a highly strung 2.0-litre turbo engine with at least 300bhp. However, because of the heavy engineering workload facing BMW on existing new model development, the compact M Performance saloon is unlikely to hit the UK until the latter half of 2015 at the earliest. Internal BMW studies reveal that the market for compact performance saloons is set for high growth in key high-volume markets, such as China and North America. With both the S3 saloon and CLA45 AMG due to arrive before the end of next year, BMW officials are keen to fast-track the new model, possibly with contracted engineering, according to sources within automotive component supplier ranks. The decision to form plans for a price-leading M Performance saloon stems from the sellout success of the limited-run 1-series M Coupé and the critical acclaim heaped on the 315bhp six-cylinder M135i hatch, road tested in the 14 November issue of Autocar. A thick shroud of secrecy surrounds BMW’s junior saloon plans. However, Autocar can reveal that the firm is mulling over two disparate strategies. The first revolves around the existing rear-wheel-drive 1-series. Already offered in three-door and five-door body styles, it will be bolstered next year by the arrival of second-generation coupé and convertible models, to be sold under a new 2-series nomenclature. Proposals call for the rear-drive underpinnings of the 2-series, which will have a slightly longer rear overhang than that of their hatchback siblings, to be used for the new 1-series saloon and possibly an entry-level Touring model. The second strategy involves BMW’s new front-wheel drive platform revealed at the Paris motor show in September as the basis for the Compact Sports Tourer — a concept of the company’s upcoming five-seat MPV rival to the Mercedes B-class. The steel monocoque ‘UKL1’ structure, which will underpin future Mini models, is also being eyed as a possible basis for the 1–series saloon to compete against the four-door version of the new Audi A3, revealed as a concept at the 2011 Geneva motor show, and the swoopy new Mercedes CLA, previewed at this year’s Beijing motor show as the Compact Sports Coupé. The A3 and CLA are base cars for the S3 and CLA45 AMG. BMW is already planning an M Performance version of the 2-series coupé, likely to be badged M235i coupé. An open-top version based on the new 2-series convertible is likely to follow. But as with the recently introduced M135i hatch, which is sold in both three-door and five-door body styles, BMW sees potential in offering a more practical M Performance saloon as well. The shortlisted rear-drive BMW platform supports longitudinal engine mounting, and the front-drive one has been conceived around a transverse engine layout. Although the rear-drive platform is considered to be dynamically superior because of its ability to achieve near-perfect front-to-rear weight distribution, it lacks the interior packaging advantages of the front-drive structure. Both have been engineered to take four-wheel drive. Cost considerations are also a concern. BMW sources suggest that the added processes involved in producing the rear-drive structure make it up to 15 per cent more expensive than the new front-drive platform. However, they also point out that the rear-drive one currently benefits from greater economies of scale because it shares components with the platform used beneath the 3-series, which is still BMW’s best-selling model. Making it front-wheel drive would allow it to be twinned with a rumoured new Mini saloon that’s due in 2015. Although a question mark hangs over which platform BMW will use, its bosses appear to have already settled on four-cylinder power for its new entry-level performance saloon. Details are scarce, but the new unit is described as a development of today’s 2.0-litre turbo engine, the N20 as it is known internally, conceived for both longitudinal and transverse mounting. With twin-scroll turbocharging, fully variable valve timing, lightweight internals and piezo-guided direct fuel injection, it aims to match the heady levels achieved by the latest version of Audi’s turbocharged 296bhp 2.0-litre ‘EA888’ engine and AMG’s similarly configured 349bhp ‘M132’ powerplant. In its current highest state of tune, the N20 kicks out 242bhp, as in the 128i. 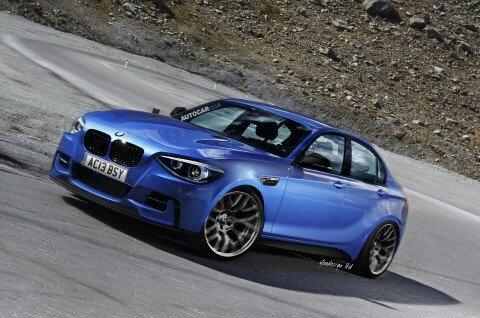 For its new entry-level M model, BMW is looking at extracting more than 300bhp from the unit. The decision to go with four-cylinder power provides a sufficient gap in the line-up to the sixth-generation M3, which is set to switch from its existing naturally aspirated 4.0-litre V8 to a turbocharged 3.0-litre straight six.